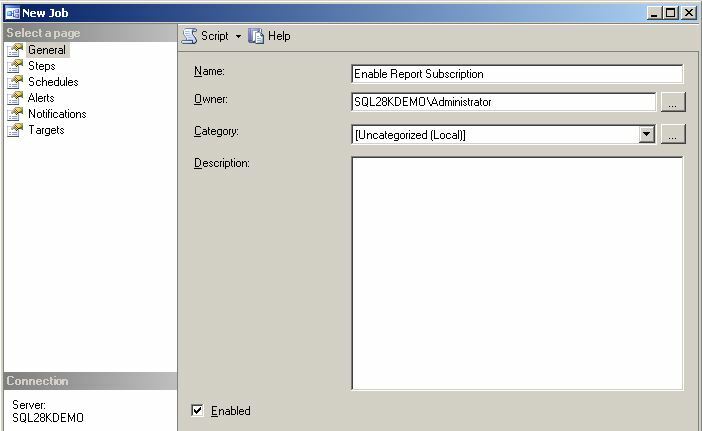 Enable or Disable a SSRS Report Subscription based upon another task or event. Whilst at a client site, I was asked whether you could stop (disable) a users Report Subscription based upon an external event, such as another SQL Agent Job or Task outcome, such as failing. 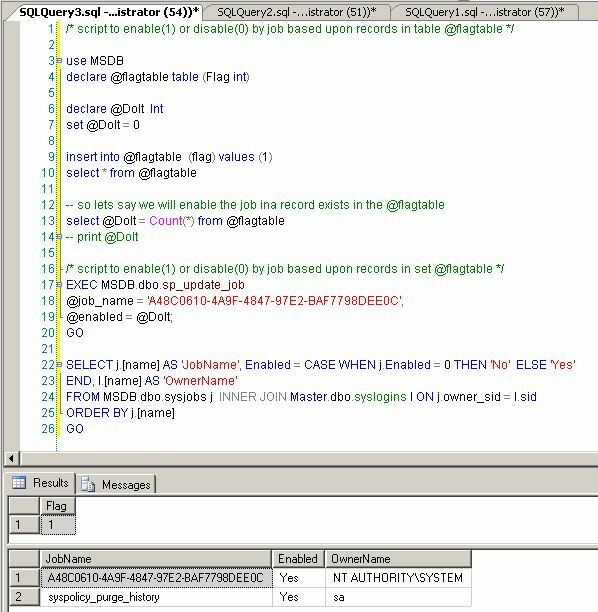 The approach I took to demonstrate how you could achieve this was to create another SQL Agent Job which “enabled” the users Report Subscription Job, based upon the occurrence of a “flag” record in another table. This table could easily be created by the calling control job, or a prior job step. The job is set to run at 19:12. 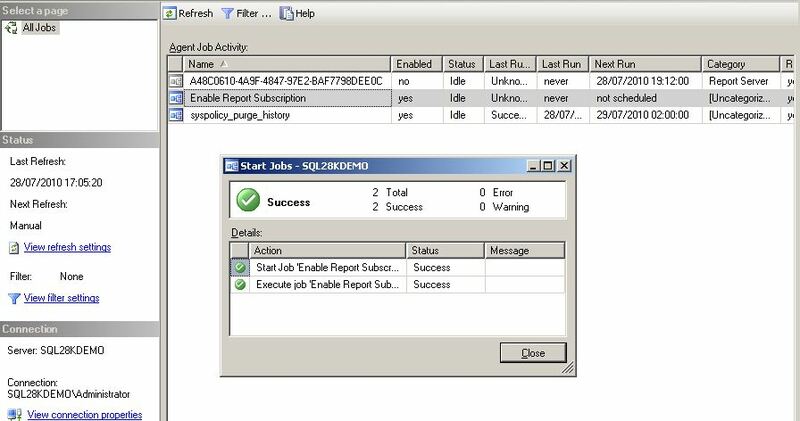 Using SSMS (SQL Server Management Studio) and connecting to the Database that the “ReportServer” database resides on, we can use the “Job Activity Monitor” to see the Job that was automatically created for this subcription. 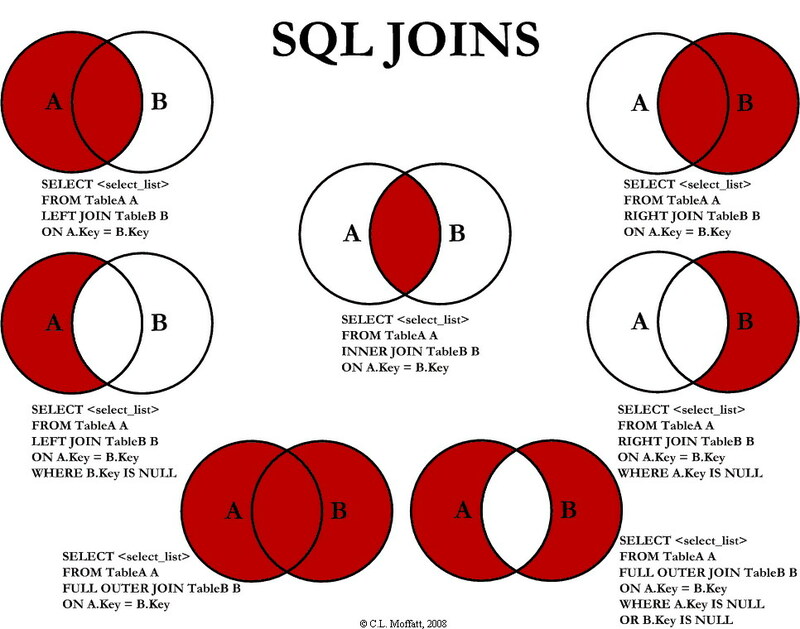 Therefore, we could setup another SQL Job, which will run this script dependant upon some logical condition. i.e. where a certain value or number of records exists in a table, etc. 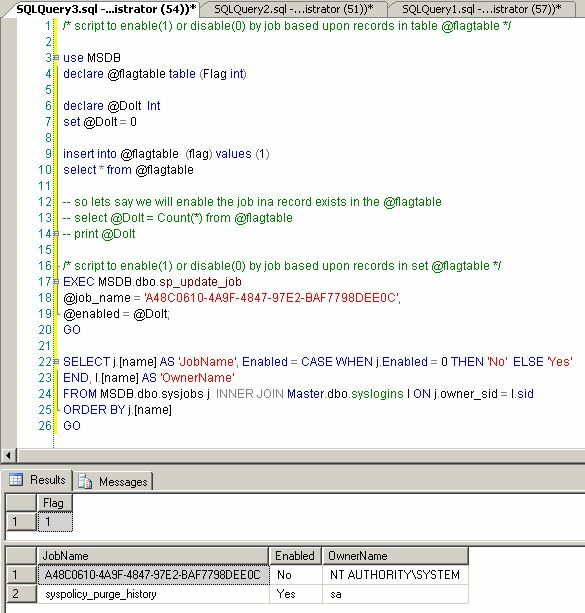 To enable/disable the job based upon say records, in a table, adapt the following script accordingly to your requirements. I have used a temporary table to demonstrate the principle. Create the following Step, and add the T-SQL to enable or disable the Job as required. Hence, if more than 1 record exists in our “flag” table, it will ENABLE the Report subscription Job. 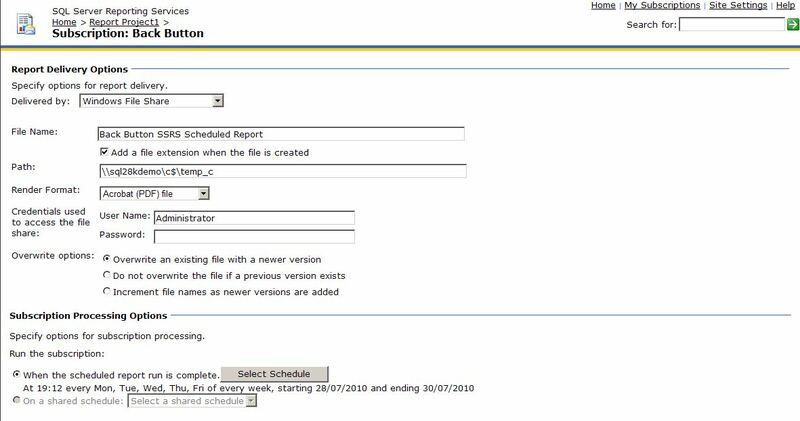 If no records exist in the “Flag” table, the Report Subscription Job will be set to Enabled = No (i.e. Disabled). Remember, you will use your own logic to set the @DoIt parameter based upon your own requirements. Though I applied this to a Report Subscription Job, it could easily be adapted for other types of Jobs. The beauty of it is that the original Job and its associated schedule timings remain unaltered. All we are doing is disabling/enabling the Job as necessary. Adding a Back Button to a SSRS Drill through Report. You have a Reporting Services report viewed via a browser that has a drill-through to another report. When the drill through report is opened, you would like the user to be able to “jump back” to the previous parent report page. Users can use the browsers back button to do this, but you would like to place a more obvious link on the Report. 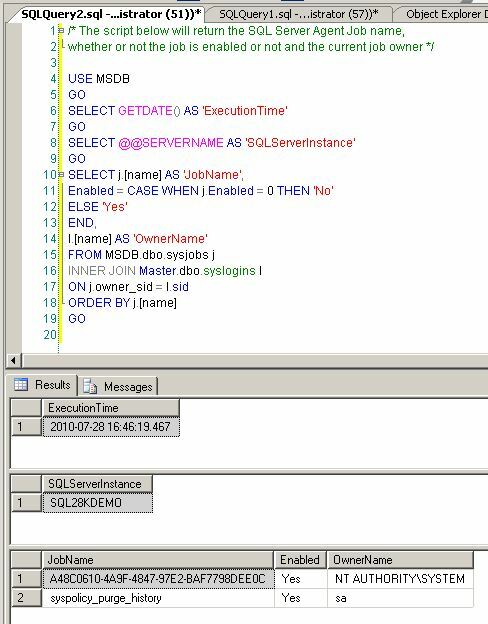 The following report was created using BIDS for SQL Server 2008. The same method can be employed for the 2005 version, though the dialog boxes may appear slightly different. Open your drill- through report (i.e. the report you will be drilling to, from another ssrs report) and add a text box, which you can format to look like a button, if you wish. After Adding the Textbox, View its Properties (right-click on textbox). When you deploy the report, and view it in your browser, the user only has to click on the “button” (Go Back) to be returned to the previous browser page, which would be the parent report.